There’s nothing like a lovely meal to keep a vacation going strong. 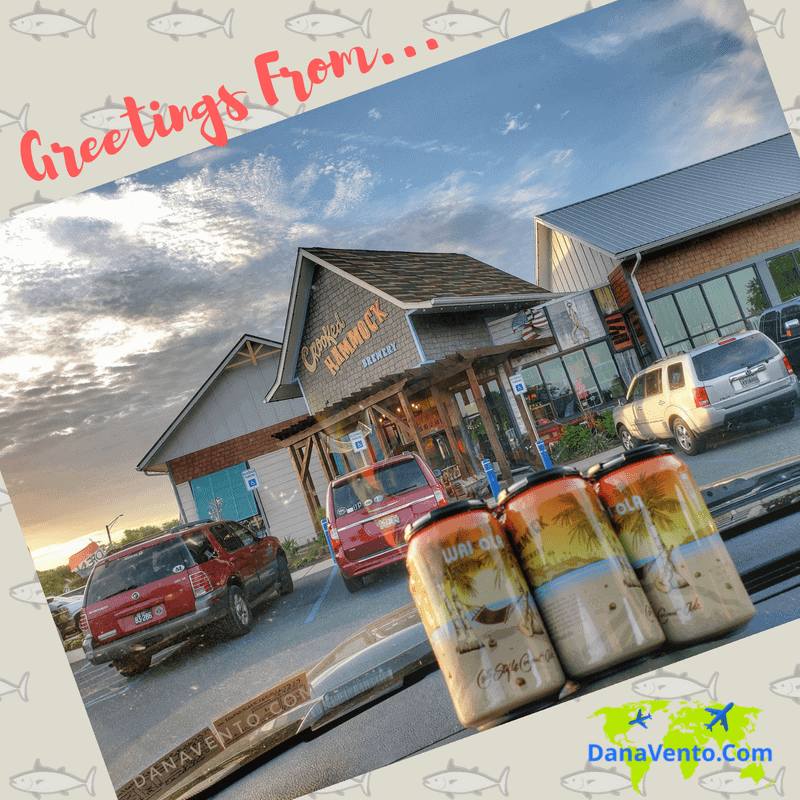 Whether you are strolling along the boardwalk and decided to grab a lunch or dinner in Rehoboth Beach or are in the Lewes area, food abounds. If you have a family, love a great brewpub atmosphere or if you prefer a more sophisticated menu, I have options for you. 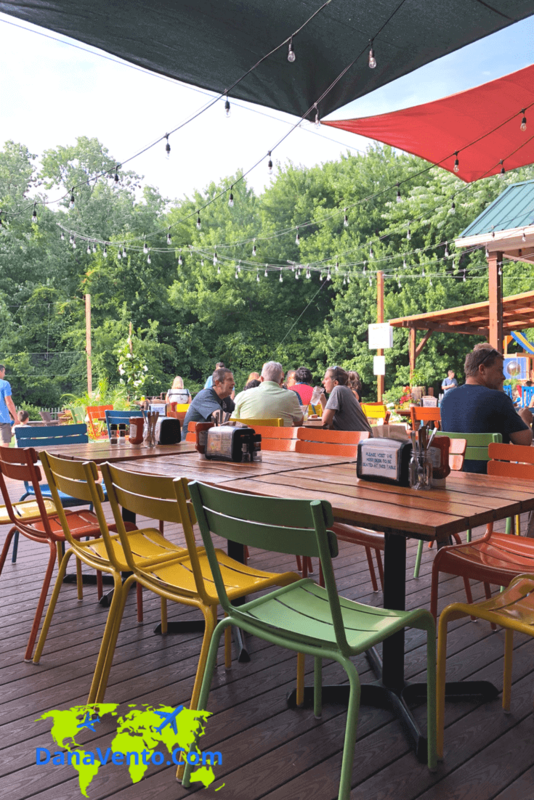 From great backyard activities, the beer brewed on site, to meals that boast generous options, Lewes is your destination. However, if you are after atmosphere, close to the boardwalk, yet off of it, a refined dining experience is close to you in Rehoboth. Truly vacation is about an experience. The 2 very different Southern Delaware destinations, I am about to share offer you options, with kids, without kids, etc. 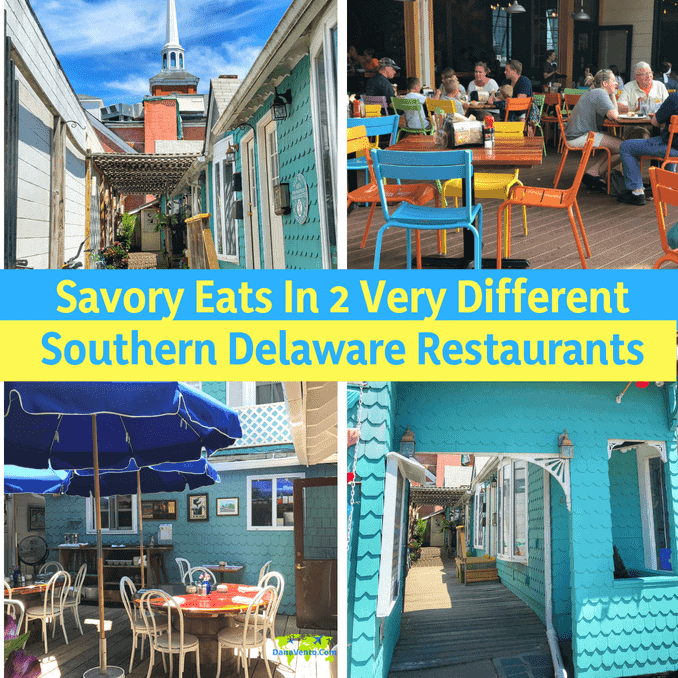 Lavishly live food out loud in the epicenter of culinary offerings and learn where there are savory eats in 2 very different Southern Delaware restaurants. Both of my dining experiences were hosted, however, opinions and images are my own. As a culinary writer, I seek out different dining around the world and only share the best of best with you. My intent is to provide you with a few images and an overview of experience so you might know ahead what a restaurant is like. These are 2 perfect choices, separated by only a few miles. As many of us travel with kids, we all know one thing, when the witching hour sets in (the feeding time), you gotta deal with it head-on and fast! While you may not be able to feed them immediately, being busy before eating is always good too. Perhaps this is the best family restaurant with an adult side to it that I have traveled to and that is saying something. From fun in brewed beverages for the adults to outdoor family activities, this is the premier destination for families. When we drove in, I knew this was a match for my family. Yes, I have older teens but it is cool for every genre. 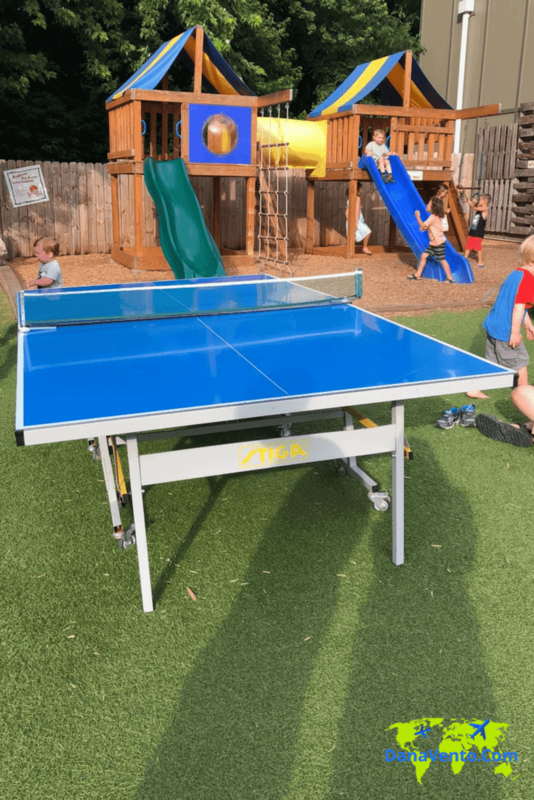 There were parties of retirees gathering and having fun to multiple tables of families with kids from 0-18 dining, laughing and enjoying the atmosphere. Truly an unexpected find. From the landscape architecture to everything that will arrive on your plate, you can just be busy looking around. Simple, fantastic gathering spots are what make vacations great and here you have one. 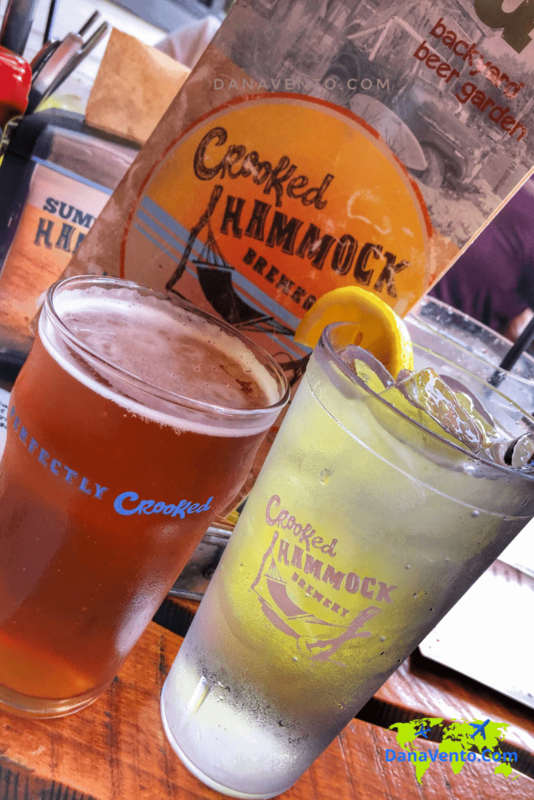 Truly the Crooked Hammock Brewery hops and the service is crazy good, even with all the people, this was impressive. NO table around us suffered and there is plenty of staff. 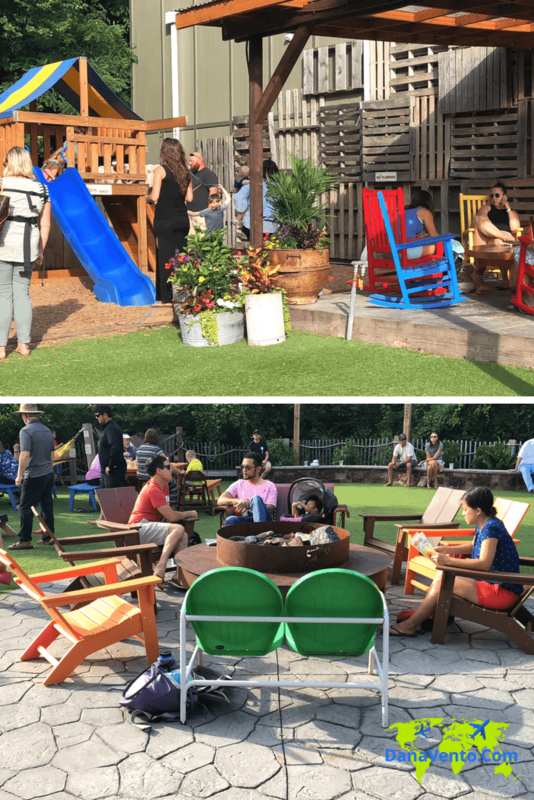 All good things to know before you head to a very busy and fun location. You will not be rushed to get through your meal and you will love the food. The brews are great (if you are of age) and the vibrant, happy environment kind of just rubs off on everyone. Sunburned and happy is what you will find! Of course, that is what the best vacations are about! 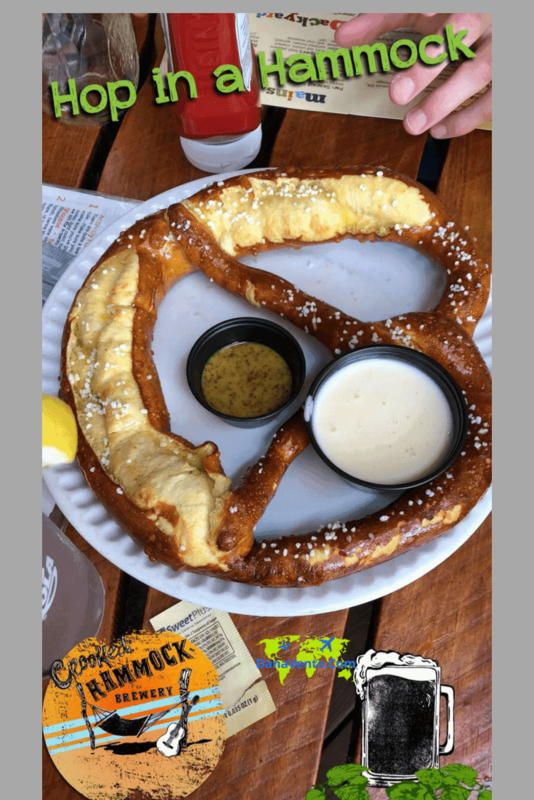 We started off our meal with an appetizer everyone could eat, a humongous baked pretzel. Of course, I added in a treat for myself, A WAIOLA beer crafted there. Totaly Delish! While we were in between appetizers and meals, we strolled a bit. 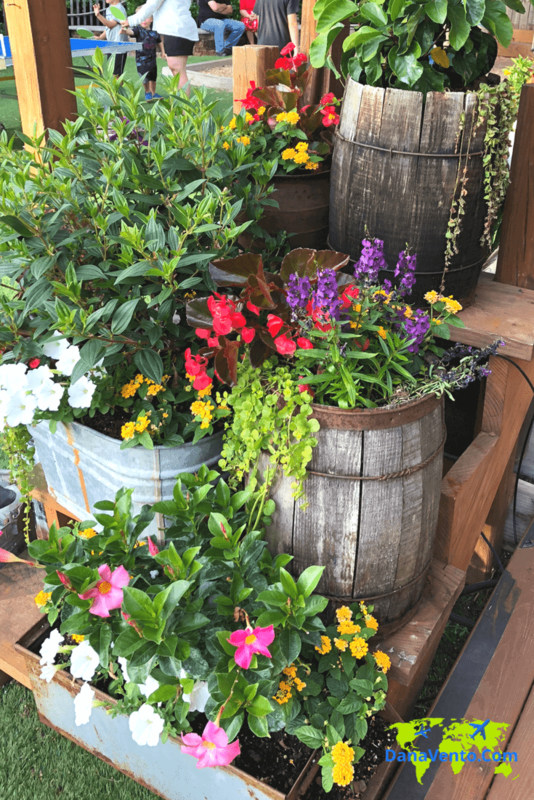 The tables are all colorful, the plantings are beautiful and there’s a lot to do. Look how pretty the ambiance is. There are kids and families everywhere. This is the perfect place to just hang out and not worry about things. Families are welcomed and the food is kid perfect and adult yummy too. Not something so easy to find when you vacation right? A screened in the bar area in the back, one inside, and plenty of seating outdoors and in. Depending on where your table is you have easy access to the play area (well that’s what I called it). Here you will find ping-pong, and corn hole and of course swinging hammocks. Enjoy! 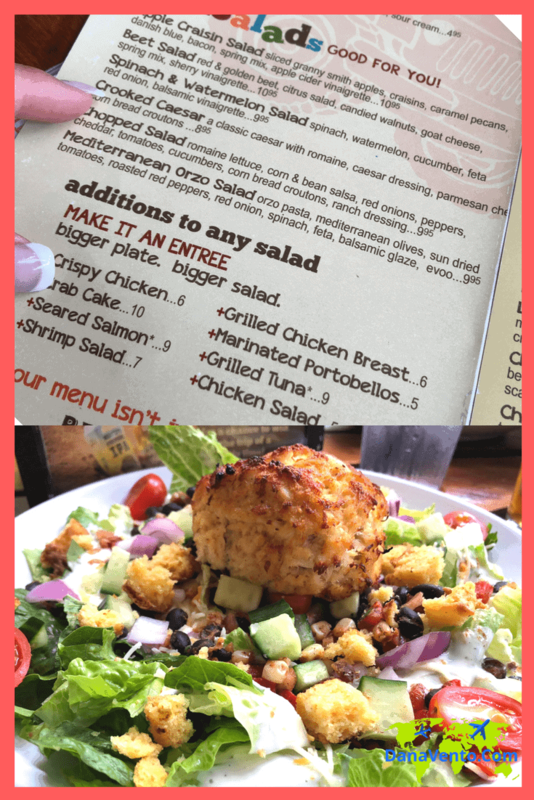 I ordered the Chopped Salad with a crab cake and all I can say is that I am happy I snapped the photo at the beginning. I gobbled it all up! Truly a light and delicious dish after a day of fun in the sun. The beer topped it off as perfection. 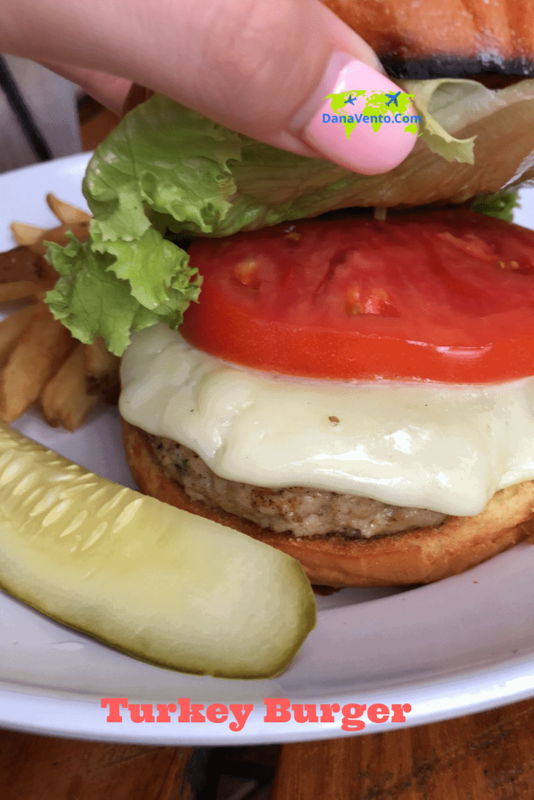 One of my kids dined on this fabulous turkey burger. It was cooked to perfection and the fries were delish! Yes, I snuck one of her fries, vacation calories do not count! Don’t forget to buy your beer to go before you leave, yes YOU can! We did, it is part of my souvenirs to myself. After every place we visit I make sure to bring a treat home too, so I can savor the experience and remember! 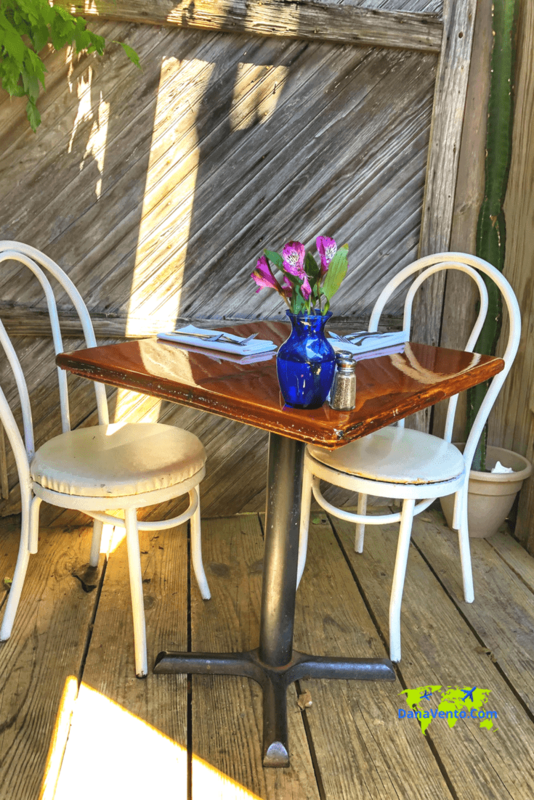 Now, the Back Porch Cafe in Rehoboth is truly an upscale dining experience, right off the boardwalk. I am going, to be honest here, if you have kids, I will highly doubt that they will want to dine here. I have kids and made a decision not to bring them, they are more picky eaters and I did not want to have to deal with it. One has severe food allergies and the other is just about his burgers and pizza, so why bother! The entrance to the Back Porch Cafe is quaint and gives you a hint of what is in store! I loved this area, and it just gets better and better. Inside there is a bar area, an indoor dining area and of course, the back porch. We sat on the elevated seat for 2. Here we could see everything going on from side to side. The ambiance is lovely. Hand squeezed Limeade is what you are staring at and it was beyond words! Next, was my Grilled Shrimp meal, exceptionally divine! 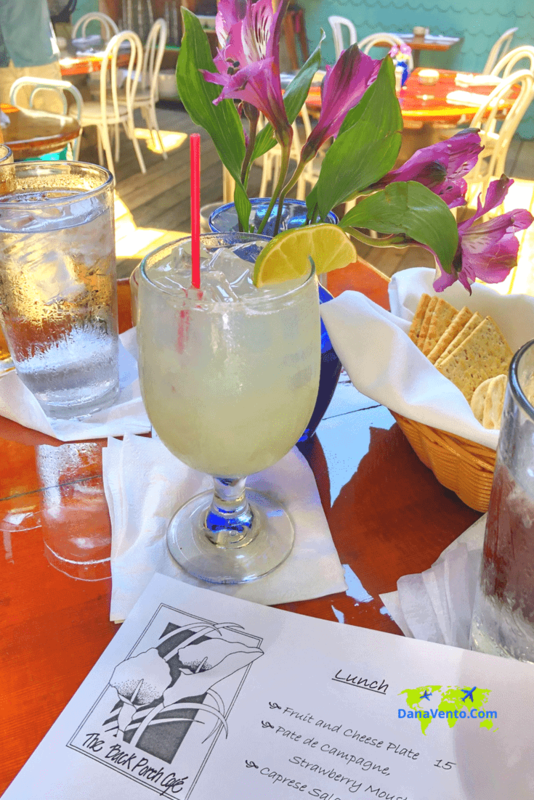 Mouthwatering and succulent, fresh and delicate with a taste that’s screaming Summer- hello foodies that visit Rehoboth Beach! Get here! 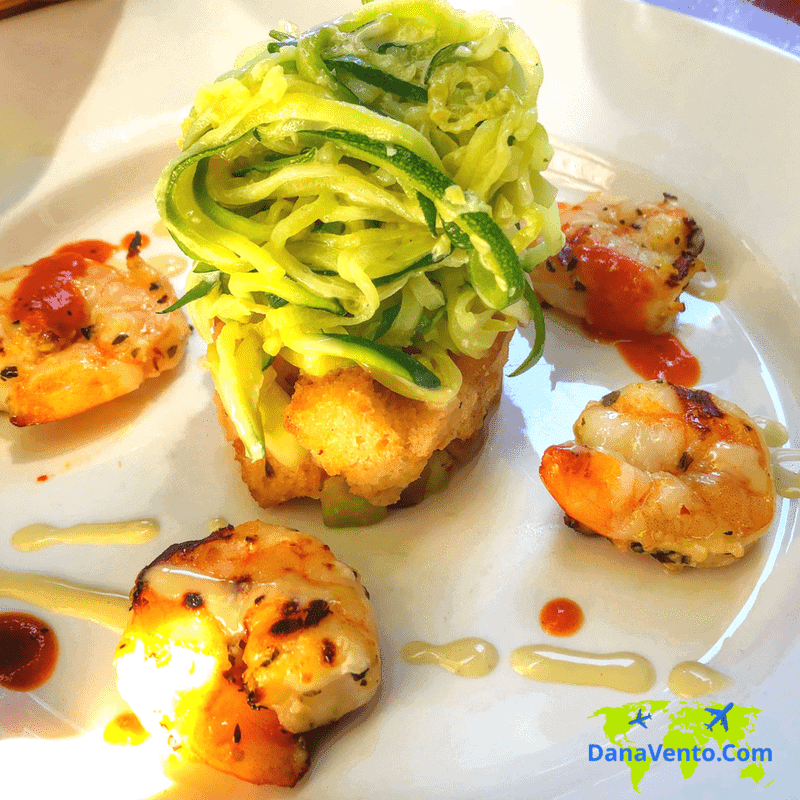 Grilled Shrimp with preserved lemon and caper Panzanella on a bed of zucchini noodle caesar. 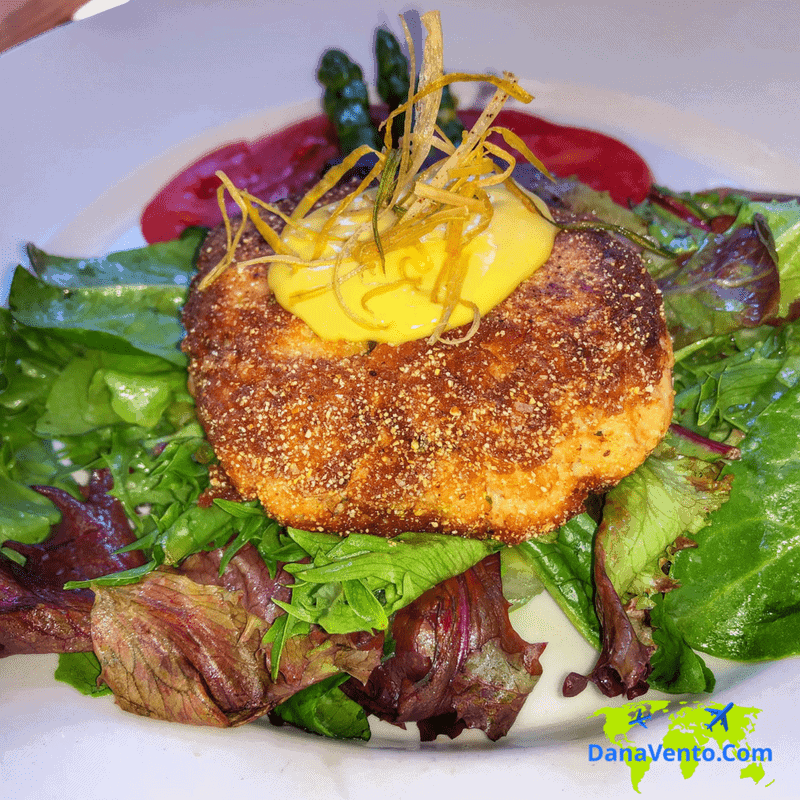 And the other entree is a Pan-seared Fish Cake with lemon rosemary asparagus with a green salad! Truly an experience on its own and possibly a reason to just stop, rather than dining. You definitely want to put the restaurant on your dining radar! It’s poetic as ending to a great meal! 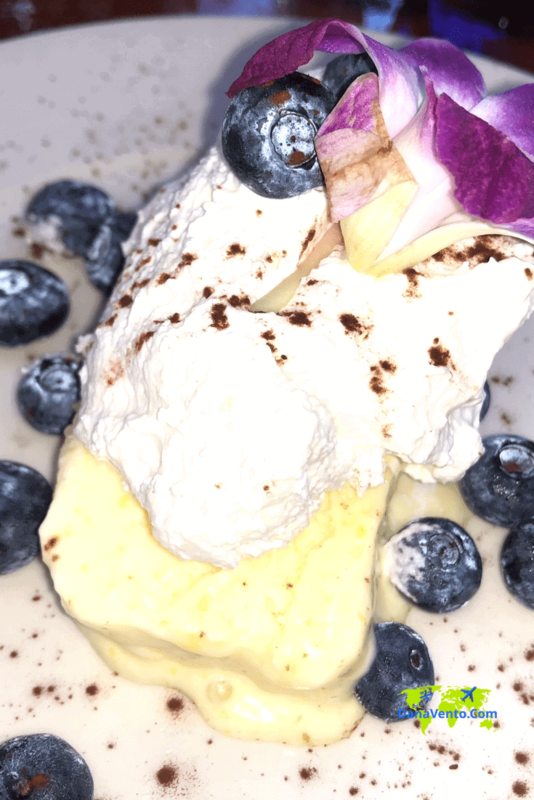 Lemon semifreddo and blueberries the contrast of taste is exceptional! The old-fashioned apple and rhubarb crisp with vanilla ice cream is a throwback to foods we all celebrate as old-fashioned yet so on par with light and refreshing.